Some companies will charge you extra or separately for having a mobile friendly website. But not us. 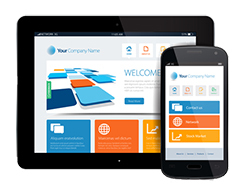 All of our websites are mobile and tablet friendly as standard. Why Are Mobile Friendly Websites Important? As of April 21st 2015, Google will boost mobile friendly websites in the mobile search results. Essentially, Google will prioritise mobile-friendly websites over non-mobile-friendly websites. This has since been referred to as mobilegeddon! It makes sense, more than half of Google’s searches happen on a mobile devise. So if your website isn’t mobile or tablet friendly, you could potentially miss out on up to 50% of search traffic! But you shouldn’t just have a mobile friendly website for search traffic reasons. Mobile friendly websites allow your user to easily navigate your site. A rubbish looking mobile site could irritate your reader. Already Have a Website You’re Happy With? If you find your website isn’t mobile friendly, then don’t worry! You don’t have to go through the whole process of re-designing your site and spending a lot more money. We can create a mobile friendly website based on your current website design. Just get in touch here for a quote. CMS (Content Management System), which allows you to update your website yourself. View our portfolio and have a look at our latest designs.